Friday night our holiday adventure ended when we pulled our little Scion into the garage at 4:00 PM. Two weeks and 3190 miles later, we don’t regret any of the days we were gone but we’re glad to be home. Well, maybe we regret the last day. It really sucked. The distribution of destination points worked out such that we never had more than a 8-hour day of driving until the end of the trip. Less driving and more visiting and exploring made us all dread getting into the car a little less. Tina brought her portable DVD player and the boys watched the Indiana Jones trilogy when the drive got too long. I brought books but I never did any reading in the car since I was either driving or sleeping. I started to write a summary of each day in this entry, but it turned into an incredibly long read, so I’ll be breaking it into a series. Watch this space for a day-by-day rehash of our journey to Arizona and back. I’m living in Iowa and trying to get my car working. I own several cars and one of them is a muscle car which my dad is helping me fix up. My dad and I trespass on a farmer’s land. The cops come and we make a break for the car, but I am shot in the back. My dad gets away. The cops question me for several minutes before I ask them if they want to look at my wound or call an ambulance. They were unaware they had shot me. I’m riding my bike through Cedar Falls trying to find my old apartment. I purposefully cut through the bank parking lot by the ATM but still end up going down a hill by a park. My previous experience (which is fictional in real life) tells me I have overshot my destination and I am bummed I have to pedal back uphill. I am at the Dental Office in NY for family and general dental services office and I remember belatedly that they should check my bottom left molar because it’s sore when I chew (in real life). I’m back in Riceville and there’s something incredible happening in the sky. It could be aliens and it could be atomic bombs. Everyone is outside watching it. The whole family is on a road trip and we decide to go through Kansas which is way out of the way. I’m late getting on an airplane that is taking me home. As we fly in to land, we dive at a terrifying steep angle. I’m back in Charleston and wondering around trying to find a particular place. I have an idea of how the city is laid out but I keep getting confused. I find a pawn shop in a really shady part of town. When I walk out of the shop I find that my car has been stolen from the parking lot. I go to a club where I know that there is a play. The play is self-referential and recursive which makes it cool. But there is something evil in the back of the club that I can never remember. I found more on the traffic incident that happened during my bike commute last night. KATU has the story, including video from the scene. Judging by the pictures, it looks like the car went right up the guy wire. I think that means he might not have been going 100 mph as someone on the scene had theorized. 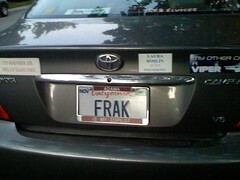 The level of Battlestar nerdiness achieved by this car’s owner is close to uncomfortable. I’m not sure if I should be chagrined or jealous. Probably jealous. 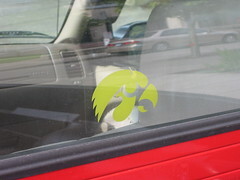 I’ll always be a Hawkeye fan.